Is Mickey’s Not-So-Scary Halloween Party Worth The Expense? Is Mickey’s Very Merry Christmas Party Worth The Expense? What Is The Best Age For A First Trip To Disney? Disney World Lingo – What Does It All Mean?! What are runDisney Virtual Running Shorts? Road Trip to Disneyland: Vegas! Road Trip to Disneyland: Pan, Tink and Hook, Oh My! Visiting Las Vegas With Kids. No, Really. Meeting Disney characters is one of my favorite things to do when visiting a Disney park. Through the years we have met the usual princesses, Mickey, Minnie, Donald, Pluto, Goofy and assorted other “good guys.” However, after meeting villains at Disneyland (roaming the park and at Plaza Inn) and at Disney World (during Mickey’s Not So Scary Halloween Party) I am hooked! 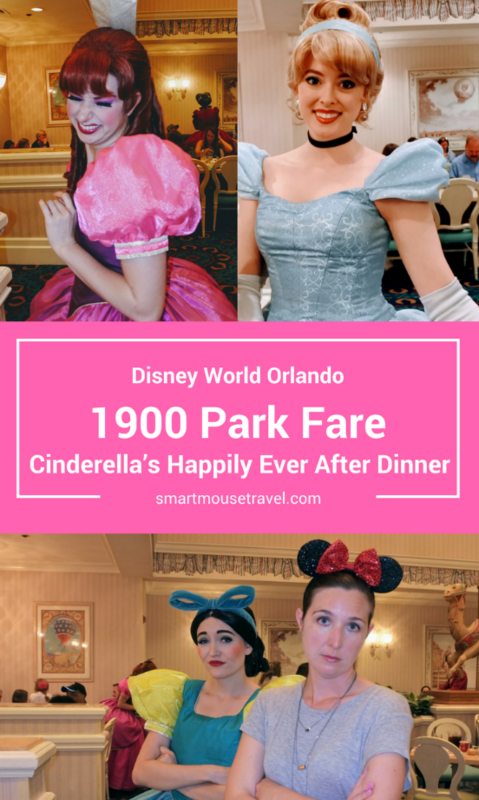 My quest for villains is why we scheduled dinner at 1900 Park Fare in Disney’s Grand Floridian – I desperately wanted to meet Cinderella’s stepmother and stepsisters. 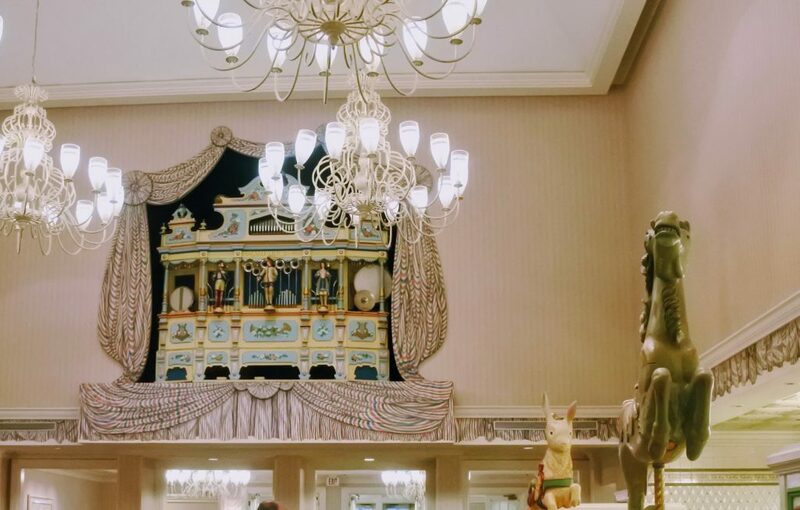 1900 Park Fare is a nondescript restaurant located within the stunning Grand Floridian Resort and Spa. It is decorated with Victorian style carousel animals and muted colors. The buffet area is located on the side of the dining room separated by some half walls. Because 1900 Park Fare has character options for breakfast, tea, and dinner I highly recommend making Advanced Dining Reservations as early as possible. Pro tip: Before you leave dinner at 1900 Park Fare go to the very back of the restaurant. There you will find Cinderella’s glass slipper and a Disney photographer to capture a family picture. Eating at a resort (other than your own) can often bring transportation drama at Disney World. Traveling directly from one Disney World resort to another is nearly impossible with Disney World’s complimentary transportation. However, going to the Grand Floridian is a little easier than some others. Here’s why: If you are staying at Disney’s Contemporary or Polynesian you can hop the monorail to reach the Grand Floridian. If you are staying elsewhere, you can take transportation to Magic Kingdom and grab the monorail to Grand Floridian there. Dinner is served buffet style. Buffets are certainly not my favorite, but they do offer a multitude of choices. This means there should be something for everyone in your group. There is the usual assortment of salads, soups, several meat options, vegetables, rice and potatoes for your meal. To our surprise we did enjoy a couple of really good dishes! My mom loved the Caesar salad, and we both loved the catfish (I don’t usually like fish) and the butternut squash ravioli. Dessert was really good, too! We liked that many of the desserts are individual tart sizes. This way you could have a little of everything, or gobs of one – your choice! The chocolate mousse in a chocolate shell was my favorite. Elizabeth has a food allergy so we requested to speak to a chef about safe items for her dinner. The chef was very helpful and verified which dinner items would be okay for her. He then returned when it was dessert time. Elizabeth would point out something that looked good in the buffet, and the chef would say whether it contained corn or was safe. It was amazing! Want to know more about dealing with food allergies at Disney? Check out my comprehensive article here. Cinderella’s Happily Ever After Dinner usually has the following characters: Prince Charming, Cinderella, Lady Tremaine, Anastasia, and Drizella. You may know Lady Tremaine better as Cinderella’s stepmother and Anastasia/Drizella as Cinderella’s stepsisters. Please note: Characters are not guaranteed and are always subject to change without prior notification. 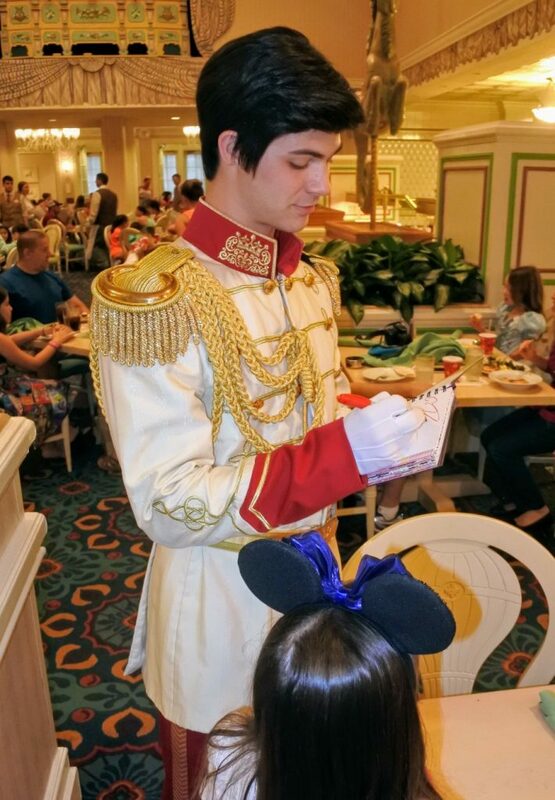 Prince Charming gave Elizabeth a little twirl when he stopped by our table and was quite the gentleman. Cinderella was as kind and lovely as you would imagine. She also made sure to say how nice it was that we would be able to meet the rest of her family. That Cinderella is a class act! 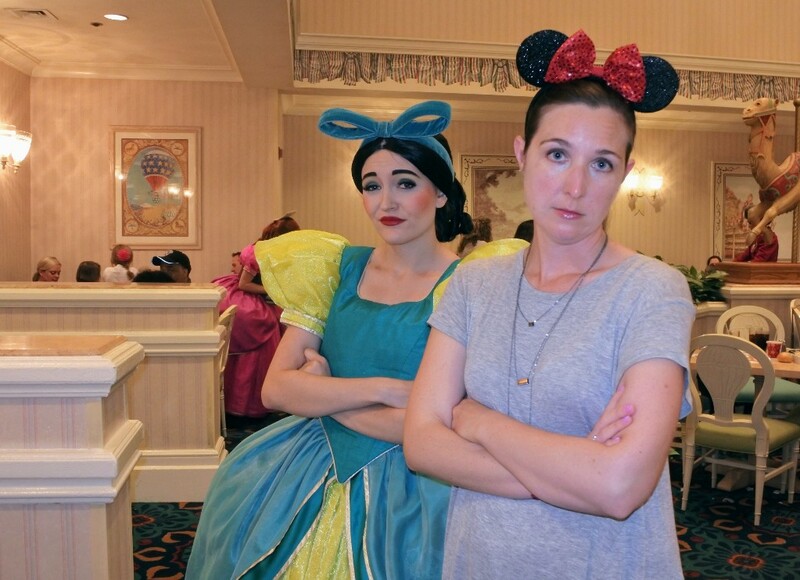 When posing for pictures Drizella has the most perfect look of haughty disdain. Even with her coaching I was unable to reproduce the look. I’ll have to keep trying! Drizella and Anastasia would often argue loudly with one another in the dining room, which was quite funny. Elizabeth and Anastasia had my favorite interaction of the meal. Anastasia: What would you do if you saw a rodent? Anastasia: Well most people would scream and some try to kill it. What does my stepsister do? She takes it in and asks its dress size! As poised and stern as you would expect, Lady Tremaine was not having any of our silliness. 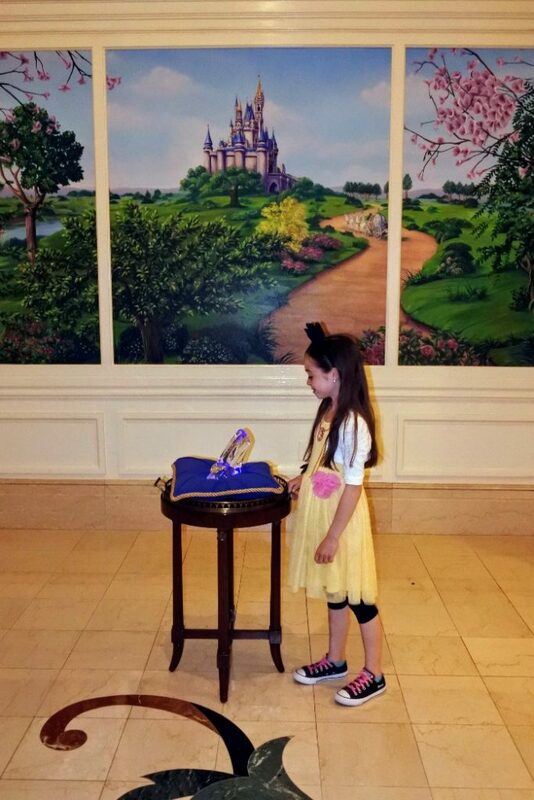 She found our rodent (Mickey) ears quite disturbing and was appalled when Elizabeth removed hers. 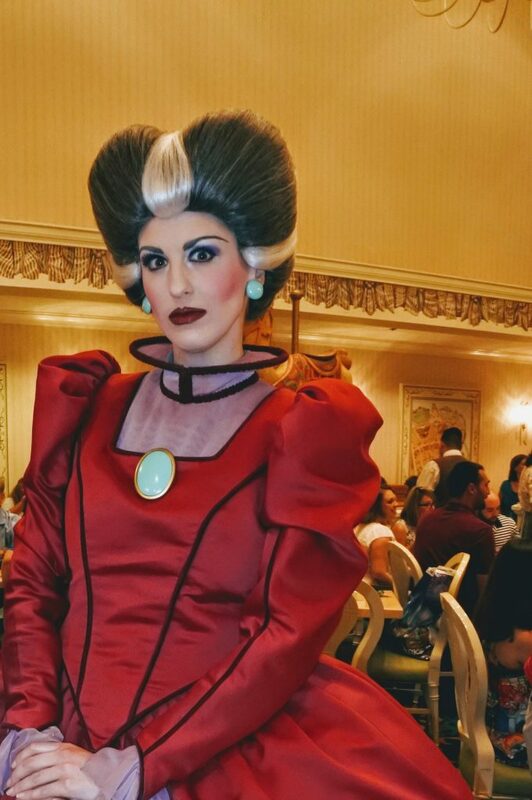 Lady Tremaine also gave me the following advice: If I ever acquire stepchildren the best solution is to simply lock them up! We had an excellent dinner and character interaction at Cinderella’s Happily Ever After Dinner at 1900 Park Fare. 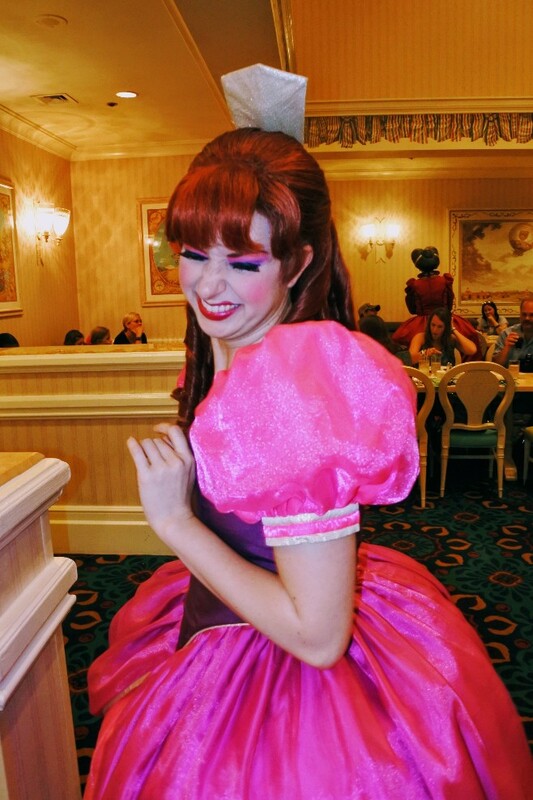 This meal is great if you have a Cinderella fan but aren’t able to score a reservation for Akershus or Cinderella’s Royal Table, or if you’d love a chance to meet villains (which I totally do: they are a lot funnier). Do you need more help planning your Disney World trip? Check out other Disney World tips and tricks in my Disney World Guides. I was in no way compensated for this review. We have done this dinner as well and maybe one of our best Disney experiences ever. Our table was tucked away in an odd spot and for whatever reason Cinderella did not stop by our table. This was of course the main attraction for both my young daughters! We made a little inquiry with one of the servers and they assured us Cinderella would stop by, we waited a little longer and it was getting a little late for our young ones. We decided maybe we would have to miss Cinderella, and try to meet her another time. 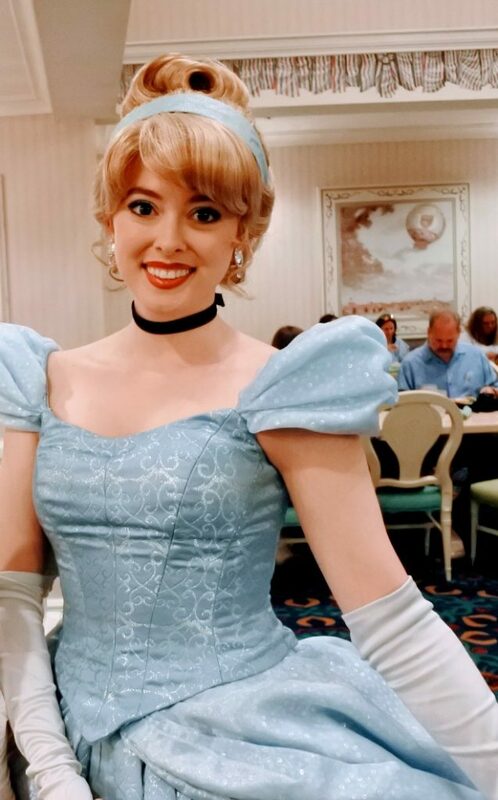 As we were walking out one of the cast members caught our attention to let us know Cinderella was on her way over and that there was no way we could leave Cinderella’s dinner without meeting the guest of honor! Cinderella then took my 4 year old daughter out the back door of the restaurant into the back of the Floridian and took Ellie for a private tour of Cinderella’s secret garden. Cinderella walked my daughter hand in hand around the garden talking with her, asking questions, and gave her a flower from her garden. They must have spent a good 10 minutes together which was an excellent way to spend the end of an already perfect and fun dinner. We were not at all upset that we may miss Cinderella but the cast made sure that wasn’t going to happen. It was definitely a memorable family dinner! What an amazing experience!I love that the cast members and Cinderella made sure to do something special for your family. Thank you for sharing! Ok I’m tearing up. That’s incredible. I can’t wait to experience this dinner in March! Food was horrible!! Made reservations and still had to wait 45 minutes past our reservation time. I’m sorry to hear you didn’t have a good experience there. We have a dinner reservation at Cinderella’s Happily Ever After Dinner on Valentine’s Day 2019. We’re so excited! How much time did you spend at this dinner? I am wondering how much time to allot for our dinner reservation here. We were seated a few minutes late for our reservation. Our meal plus all character interactions and photos with the glass slipper took around 1 hour and 30 minutes. So our entire time at 1900 Park Fare was just under to 2 hours. Have fun! Sign up to get the latest updates!